Setting ourselves as one of the top names in the industry, we intend to enthrall our customers with incredible performance. As a prime player, we proudly present Security Cabin to our customers. It finds its use as a safe structure for security guards to carry out their vigilance. It is suitable for places like factory buildings, warehouse, commercial complex, offices, and institutions. According to the site requirement, we make customized sizes available. 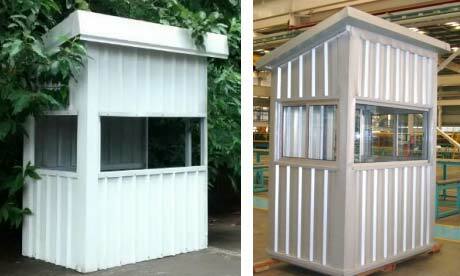 More About Security Cabin : Our company is manufacturing and supplying Guard Huts/ Security Cabin throughout the nation, which is constructed with insulated panels PUF/EPS. It is chiefly used for providing appropriate and safe structure for the security guards to stay and keep a vigilant eye on the passerby. These guard huts are suitable for factory buildings, warehouse, commercial complex, offices, institutions and other similar places. Customized sizes are also available with preferential placements of doors and windows as per site requirements.